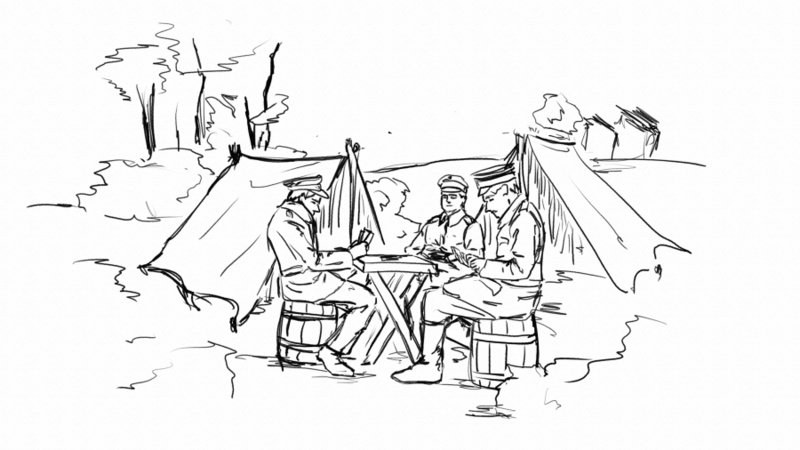 All Quiet in the Trenches is an anti-war game set in the First World War. As player you lead a handful of soldiers through the war on the Western Front. The game’s goal is to survive the war without losing the trust of your superiors and soldiers. It combines turn-based tactics and social simulation and tells an interactive story based on your actions and decisions. The game is developed primarily for PC, single-player only and will be released in 2019. Your actions don’t change the war. They change the lives of your soldiers. Soldiers are human – For your experiences and the fates of your soldiers to be relevant and memorable, they can’t be face- and mindless tokens. Each soldier has a personality, a unique background and reacts individually to situations and circumstances. Victory isn’t necessary – The Western Front became synonymous for stagnation and a futile struggle for the same soil over and over again. The war can’t be won, neither can every battle. It’s your responsibility to decide how much you burden your soldiers to try and fulfill the possibly unattainable military ambitions of your superiors. Killing isn’t necessary – People die in war, especially in the First World War. But a lot more get wounded or captured. In All Quiet in the Trenches, fire is supposed to suppress and demoralize. Whether people get hit in the chaos of battle is random and can’t be counted on – but even a missing bullet has a guaranteed effect on the target’s will to fight. Every game tells an individual story – For your actions to change the lives of your soldiers, every decision and every dialog-choice will have consequences. Sometimes they may seem small and unremarkable, but the sum of small changes will always lead to a different story and reflect your influence. The game has two alternating phases: The Mission in which you lead your soldiers on the battlefield in a variantion of turn-based tactics gameplay and the Camp where you manage the resources and work projects of your group. Soldiers and their individual personalities are in the centre of both phases. Regular Events take a closer look at specific situations happening, in which the soldiers act and react based on their personalities. In the mission, these are mostly quick interactions focussing on urgent situations. During camp they’re less hectic, but often deeper, dealing with the soldiers trying to process their experiences, getting news from home or interacting with each other. Events require a player reaction – usually in form of a dialogue in which you’re presented with different options to reply. As previously mentioned: Each of these options has consequences – even if it’s sometimes just that the soldier will like you more or less depending on how he thinks about your reaction. The soldiers relation towards you as well as his personality also defines how he himself will act in the event. So it may happen that you see the same event twice, but due to the different personalities of the involved characters – or the change the same character has gone through since the last occurence – the events play out completely different. It’s essential to get to know your soldiers on a personal level, if you want to be able to understand how they act and react. This is especially important since their personalities and circumstances have a major impact on their actions during battle. You may give a soldier an order, but you won’t know whether or how he’ll execute it. But more on that in the next blog post.